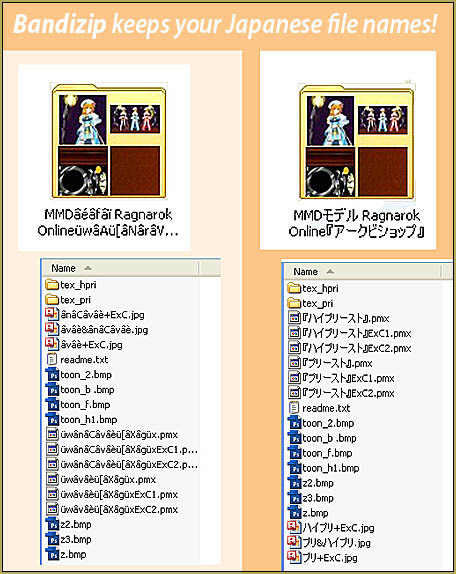 How can I keep the Japanese file names when I download and extract new MMD models? Do I have to use Applocale to keep the file names from getting scrambled? lets you keep the original Japanese file names! Over the years that I have been enjoying MikuMikuDance, the on-going bugaboo has been the scrambled file names that occur when you unzip a Japanese model… I have been using the 7-Zip/Applocale routine as my favorite method… but just today I was pointed to Bandizip. Download the Bandizip set-up file and follow the defaults as you run that program. I opted to not add the icon to my toolbar… but I DID go for the desktop icon. 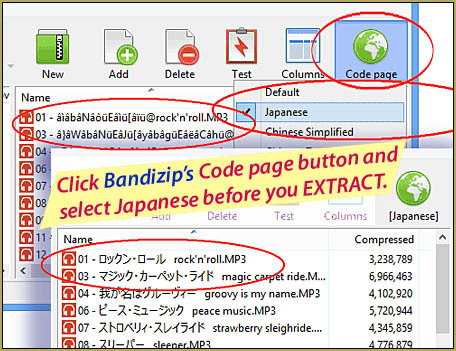 Using Bandizip is easy. Double-click the desktop shortcut icon… navigate to your zipped folder… Click the Code page button to select Japanese… and then click Extract. I just clicked OK for the defaults… and there was the new folder with the Japanese file names… too awesome! … unless you still have the model’s original zipped folder. You will find that the model, when loaded, may still have the NULL bone names. That’s always a problem… but our xxBodger has a solution using PMDE and Google Translate. Wouldn’t it be easier to change your computer’s locale to Japanese? None of my file names come out scrambled usually. That’s a good solution too, but it’s not realistic for everybody– some people need to maintain their own locale, maybe to keep another language from scrambling.